Description: wst.rdb wrapper model, serves as Dali’s interface to the wst.rdb model. Also provides UI extension of New Connection Wizard. Description: UI Selection Framework; provides a selection manager to listen for and coordinate selection events that the Dali UI is interested in. This plug-in is still undergoing a lot of refactoring. Description: A set of utility classes for the Dali plug-in. Contains a set of advanced iterators, plus utilities for dealing with Files, Strings, Collections, etc. Description: Contains a suite of headless JUnit tests for the core plug-in. The Dali Core makes extensive use of the JDT Core model and utilities for the purpose of reading and writing java class metadata. Future integration with the JDT will include use of the APT for the purpose of annotation value completion and high level annotation validation. The Dali DB and DDL plug-ins make use of the data definition model, the New Connection Wizard, and the DDL generation capabilities. The Data Explorer view is an integral part of the Dali Persistence Perspective. This mapping extension creates a way for Dali extenders to define additional mapping types beyond the JPA specification. 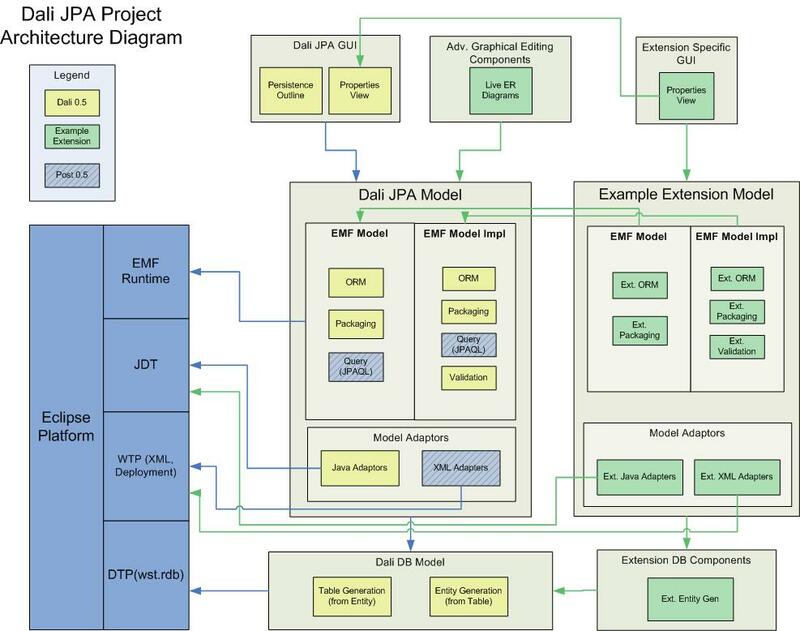 This mapping extension is used internally to define the JPA mapping types in the core model. It also formalizes the necessary classes to define for extending the core types. For UI support, a corresponding extension in the UI must be defined. This mapping extension allows an extender to redefine the default mapping for a simple attribute type. This mapping extension allows an extender to define a mapping type that will be available for selection in the UI. A corresponding Core Mapping Extension is required to add mapping support to the UI. After defining a UI Mapping extension, the defined mapping will be available for selection in the “Map As:” combo box in the persistence properties of a persistent attribute. Extension points will need to be defined in all of the places that the JSR 220 Specification leaves undetermined behavior. This includes areas where a default value is implementation specific, such as the Primary Key Generator Strategy. Extension points will also need to be defined for additional Entity configuration. This would include adding additional capabilities to an Entity, resulting in a new proprietary Entity. Extension points along with API’s will be determined as the project matures, and requirements are applied from Dali extenders. API has not been defined for the 0.5 release of Dali. We think the API should be drawn out from real use cases and requirements from extenders.